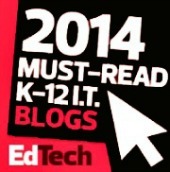 It's SO easy to get overwhelmed with all the new education tech and trends going on in the world. Sheesh....I could go on! It's EXHAUSTING! 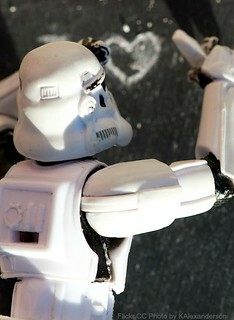 Then....there's all the new technology that you have to get, use, and master! Don't have an unlimited budget or a super generous PTA? OK, now you have to get funding from a place like Donor's Choose. (Which is totally, doable! But does take a wee bit of effort) Once it was Smart Boards now it's Tablets and 3D printers. Then what? What happens when you run out of money to buy the supplies? OMGosh, again. Exhausting! Take a Deep Breath, It's OK! But I'm here to tell you...It's OK. You don't have to try to be the expert at everything. You don't have to totally flip your classroom making videos yourself to take the place of daily instruction. 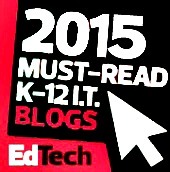 You can start by sourcing some great videos already created and add them to your lesson plan. 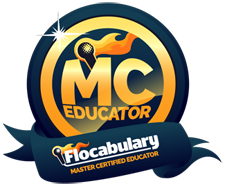 From places like YouTube, Schooltube, & Flocabulary you can add that rich Remix Mash-Up without hours of video editing. I call it the partial flip - having augmented information available for tutorial or reinforcement and to spark student engagement. My Lesson Path (formerly Mentor Mob) on Big Rich Mt. Olympus is an example of this. 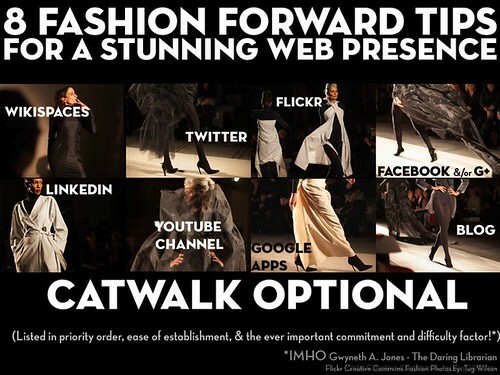 Curated rather than created content. Instead of pitching out all of your furniture to create a brain based & friendly learning classroom why not just buy a few bean bag chairs for $39.99 on Amazon to create a comfy reading nook or discussion circle! Instead of building a whole lego wall or a Makerspace center spending thousands of dollars with expensive equipment. Why not start small and create a Makerspace cart that can roll around the school with bins of Legos, patterned duck tape rolls for crafting, and a couple Makey Makey kits? See below for more ideas & resources. And if it doesn't catch on, you lose funding, replacement materials gets to be too much, or it just flops? You haven't invested all that much! But most likely you will love it, your kiddos will go crazy over it, the parents and admin will be impressed and you will want to expand it. Either way - you win! But it's OK to start small & grow! Instead of stressing about not having tablets to utilize mobile media in the classroom, use your own iPad or smart phone and film Vine video stop action animation book trailers, science experiments, art talks, or social studies history snippets! UPDATE 6/2018 -- OK, Scratch Vine, now use Instagram! 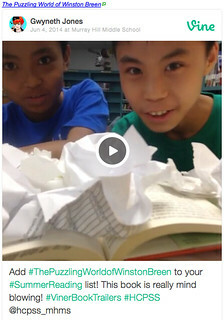 60 second videos you can easily make book trailers, book promo videos, library public service announcements, and more! Or spark the engagement of Twitter and the ease of Google forms to have the kiddos write a #StoryIn140, do Twitter style book reviews or QR Code Scavenger Hunts! OR use QR Codes around the school with Loo Reviews & Pocket videos or 10 Things to do with QR Codes at Back to School Night! It's not the tool it's how you use it! 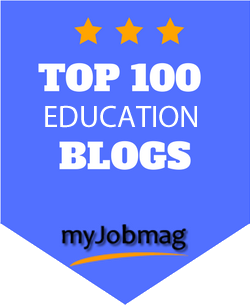 That's right, the coolest ed tech trends you've heard about at conferences, on Twitter, or during a webinar, you know, the ones that may have also been leaving you awake at night feeling stressed out or inadequate for not jumping in with both feet? Yeah, those. They don't have to be all done at once! You don't have to overhaul your life, you can just adapt! 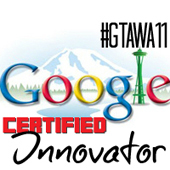 You can simply "pilot" and "beta test" new technologies and new teaching ideas on a small scale. Then, when you find one you like - you can go steady. Date a while. See how it goes. When you're ready to commit, you'll know it! You also don't have to get each and every new tech tool that comes out. Remember the Laser Disc? Buy one for yourself maybe and get good at it. Bring it to school and try it with small groups. My school isn't a 1:1 or total BYOD school or iPad school. Some of the coolest things I did with QR codes and mobile media in the early days (5 years ago) was with 2 iPod Touch Gen 4's, my own smart phone, & my first iPad. It's NOT what you have, it's the creativity of how you use it. It's the innovation of teaching and not the tool. Tools come and go, the daring spirit to try new things keeps moving on! 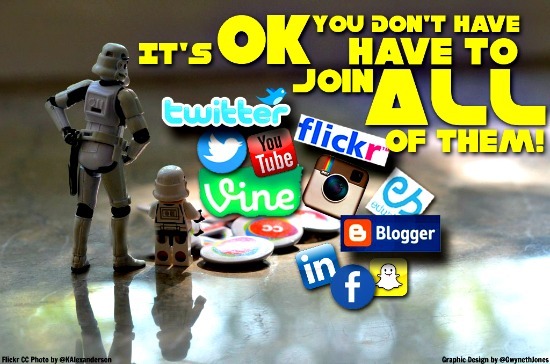 There's a LOT of Social Media outlets that are out there - which ones should you join? Which ones should you just be registered to and which should you be actively involved with? Sure, I've blogged about Transparency is the New Black and one of my missions is for all educators to model and create a positive web presence so that they become more visible (and less vulnerable) in their schools and in the communities. But gee whiz, there are only so many hours in the day, right? If you're a long time reader or follower then you may know that Twitter and Scoopit are my preferred social media tools, that I broke up with Facebook years ago, and that I'm committed to this blog that you're reading now. So, what's your outlet of choice? 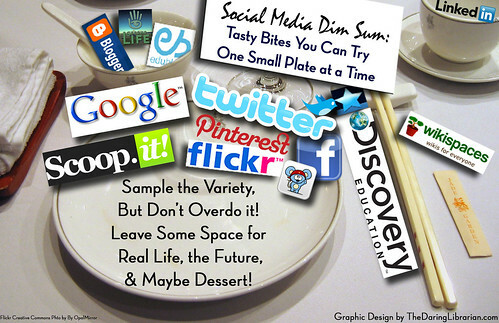 Years ago (2008) I created a couple graphics to illustrate that life...err Social Media is less like a fancy Table d'hôte menu and more like a Dim Sum experience...or Tapas! You can just just try small plate here and there - like it? Get another! Not to your taste? Push it aside and move on. Funny how the plates have changed over the years! 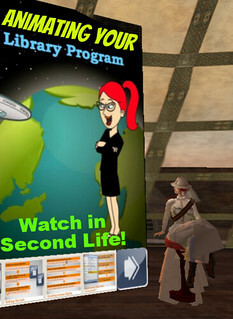 Second Life and Nings are out and Instagram and Vine are in! Oops! Vine is out! See? Platforms may change, but our daring innovated change agent spirit moves on. Say Yes! To a School Instagram! 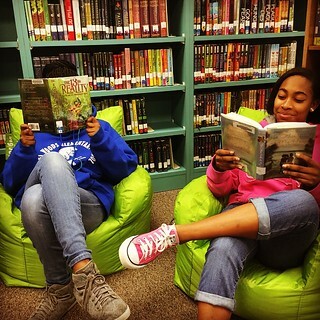 15 Librarians To Follow On Instagram +5 More! Here's what social media outlets & tools I am active on, followed by those that I have a presence but not a penchant. The first list means that I'm here at least once a week - if not more. As a commitment to my profession, I have foregone a personal social media and just maintain a professional one. That was my choice. I have a formula. Listed in order of my preference, time, & devotion. Like, we're in love and dating steady, OK? Don't stress, just can pick 1 thing! 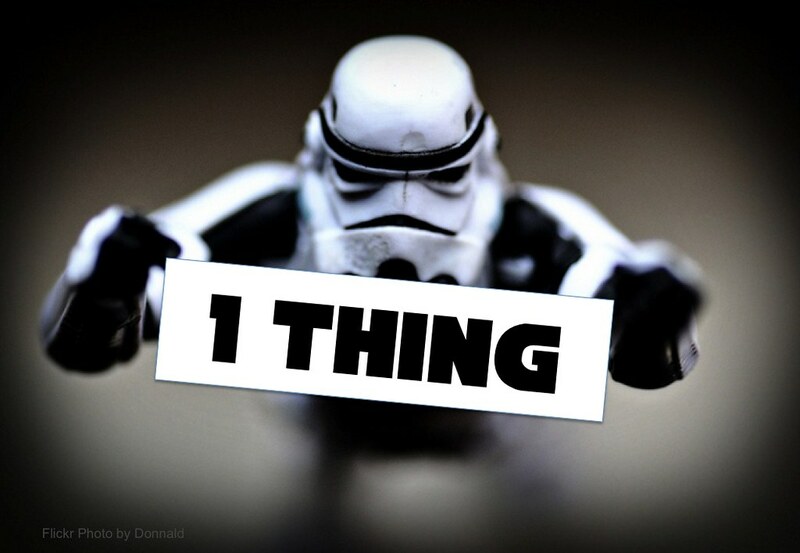 A week, a month, a school year....just 1 thing! Ready for more? Consider Adding these! I'm sorta here, I filled out a profile, but I don't visit very often. It's more to point you to where I really am. Like, we're friends, nothing too serious. 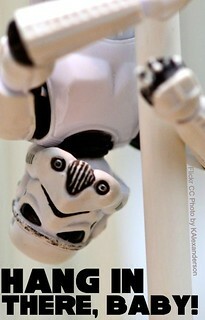 I tried it, I don't like it, You can't make me do it! Don't poke me! Now it's YOUR turn! What social media outlets can't you live without? What did I miss? Disagree? Bring it on! Agree? I'd LOVE to hear it! What new trends do you love, hate, & want to marry? BONUS! 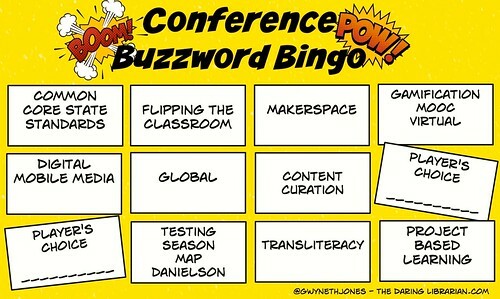 Feel FREE to Download & Play Conference Buzzword Bingo! 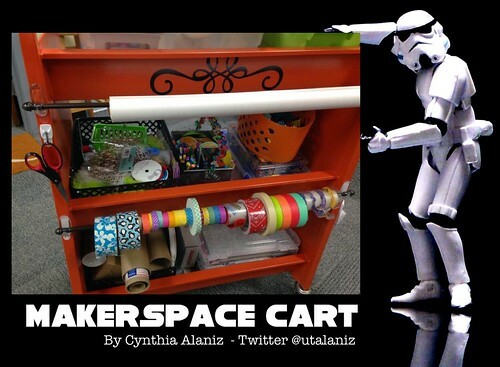 A cool Makerspace cart for around a grand! Thanks for this post Gwyneth. Sometimes I feel overwhelmed by the flood of new ideas, technology and social media. I love the idea of dating and beta testing - it sounds much more manageable! I'm so glad this post spoke to you! 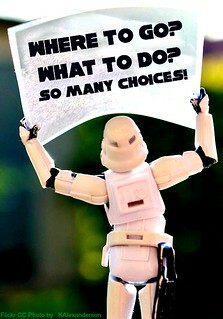 I know that sometimes it's stressful thinking you're not moving fast enough keeping up with new trends! I guess I wanted to be a voice of reason out there saying "Don't worry, it's OK to go slow or to pick and choose!" 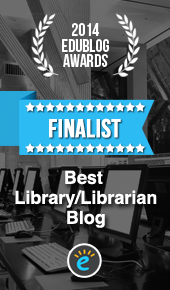 Can't live without Twitter & my Wix site for the library & blog. Disagree- so far ScoopIt. I can't get into it. I'd like to if I could make it look more awesome maybe? Don't know. Right now I use Symbaloo to cultivate for staff & students. Mostly to provide the students a research resources page of things they can use while doing research like Easy Bib, Library of Congress, etc. IDK, we're dating I guess, nothing serious. I like the organization and that it's embeddable, but eh... My latest relationship has been with Google+. I've added some communities and done some posting in the last few weeks. It seems like an older lost cause for communicating with the general public, however, as we go all Google next year, I can see potential for staff members using it to share ideas. Right now it's just me pretty much repeating what I already put on Twitter. 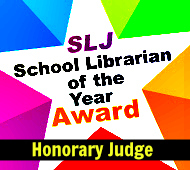 I love a Wikispaces page because I can make it look purty, it's widget friendly, & it's easy and quick to edit! 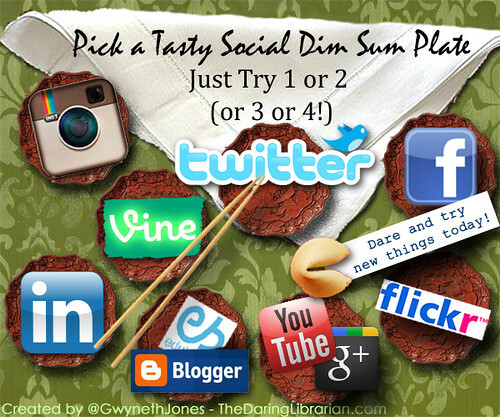 Nice idea to use social media sites for teaching and learning impressively! We can't stop the flood of technology & related gadgets. So it is better to use it for learning & exploring new ideas.Instead of giving students readymade materials like essay services,workbook,guides,..etc,encourage them to read,research & then write their own ideas! This is so cool and I love the concepts and implementation that you are using to change up the way we teach our youth keep it up. 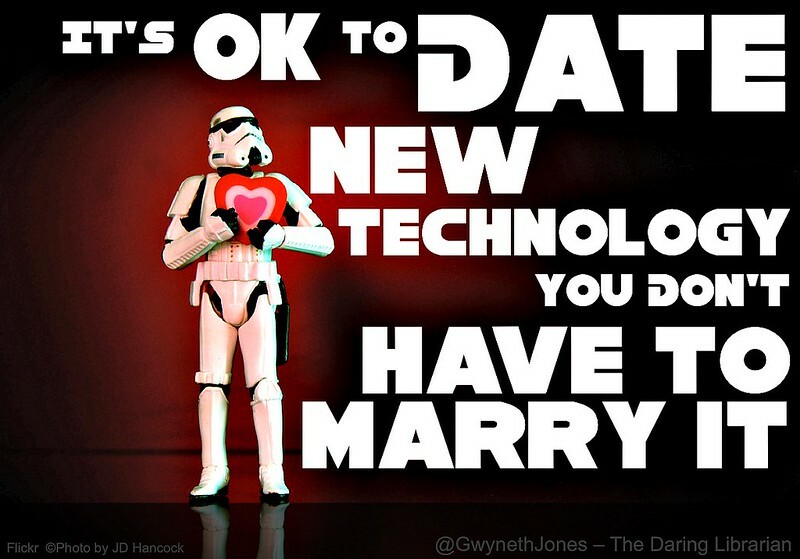 I absolutely love the analogy "Its okay to date technology, you don't have to date it!" Great overview of new tech to try. 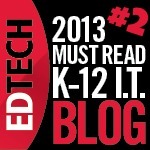 I'm going to share with my EME2040 students (Intro to Ed Tech).